Providing students, pastors, and lay people with up-to-date, evangelical scholarship on the Old and New Testaments. Designed to equip pastors and Christian leaders with exegetical and theological knowledge to better understand and apply God's Word by presenting the message of each passage as well as an overview of other issues surrounding the text. Includes the entire NLT text of 1-2 Timothy, Titus, and Hebrews. Linda L. Belleville PhD., St. Michael's College, University of Toronto, is Professor of Greek and New Testament at Bethel College in Mishawaka Indiana. She has published commentaries on 1 and 2 Corinthians and various articles and essays on 1 Timothy. She has been a member of the translation team for the New Living Translation since its inception. Jon Laansma Ph.D., University of Aberdeen, is Associate Professor of Ancient Languages and New Testament at Wheaton College in Wheaton, Illinois. He is the author of several articles and of "I Will Give You Rest" The "Rest" Motif in the New Testament with Special Reference to Matthew 11 and Hebrews 3-4. 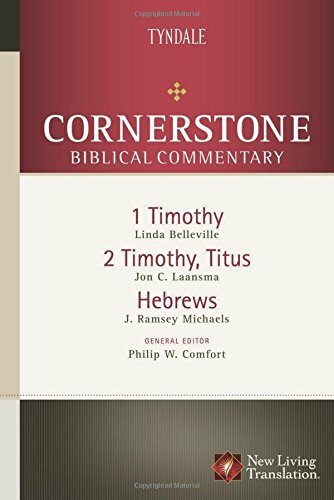 He contributed the introductions and notes for 1-2 Timothy and Titus for the NLT Study Bible. J. Ramsey Michaels Th.D., University, is Professor of Religious Studies Emeritus at Missouri State University in Springfield, Missouri. He has published commentaries on the Gospel of John, 1 Peter, and the book of Revelation. He has been a member of the translation teams for the New International Version and the New Living Translation and has been a consultant for the American Bible Society.